I like to cook, but prefer to keep things simple. So it’s a mystery to me why I slave over Christmas cookies every year. Since cut-out cookies are such a novelty here, we use them as an opportunity to reach out to our neighbors during the holidays. But the truth is that when we started this tradition, our oldest son, Steven, liked to cook and he did most of the work. This year I was on my own in the kitchen and dreading it. I actually woke up Saturday morning asking the Lord to give me the grace to get baking. I am NOT a cookie decorator! But in spite of my anxious thoughts, I was able to push through and finish the first batch. It made me think of the dozens of times I’ve said to the Lord, “I just can’t do it!” and the many times He has come to my rescue and enabled me to do what I thought impossible: Like when I had to teach Theology of John Wesley in Portuguese when I could barely speak the language. Or when I felt the Lord leading me to begin a ministry with pre-teen girls even though I had my hands full with four rambunctious little boys. Or when I was asked to train Sunday School teachers when I never had any training myself. 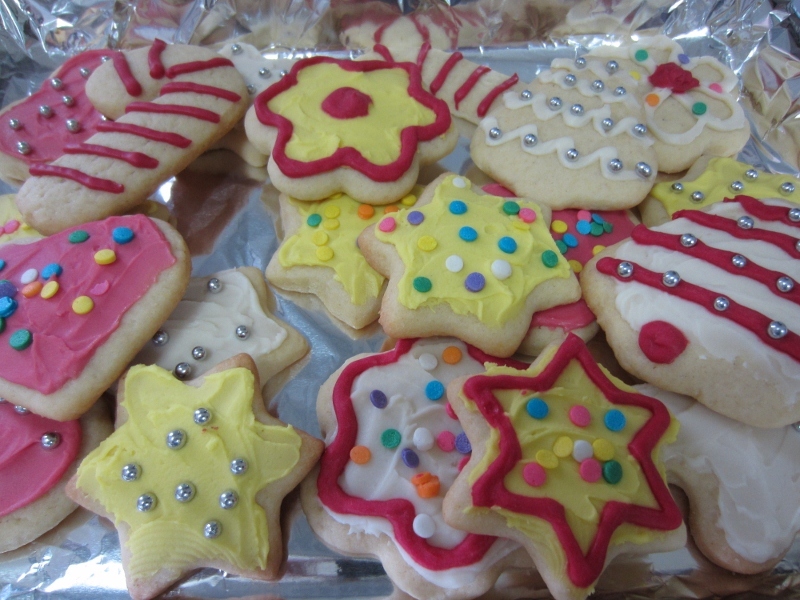 The cookies are lovely and you can no longer say you aren’t a cookie decorator! Merry Christmas!! The cookies are truly the most beautifully- decorated cookies I have seen anywhere. I know that’s not the point of the article, but like your ministry to the Brazilians, it snags the attention. I identified with your son doing cooking. When I had eight children at home, the work of running the home was divided out. Now they are gone, except for my mentally retarded son, and the whole gamut of everyday chores is mine. Doing them with the joy and creativity you displayed in your cookies IS by God’s grace. Your cookies look very nice. What a lovely batch of cookies. They look like the work of an artist! You have a wonderful way of turning something like this into a spiritual message, just like the books you have written. I thoroughly enjoyed those. Thanks for the reminder that God is with us in everything, great and small. The cookies look marvelous. And the story reminds me of when you shared with the Wabash women: If you want to talk on water, you have to get out of the boat. I was glad to bump into David and Nathan and SAU last week. Great to see them and have them take the time to stop and chat with me. (I have been taking Spanish 101 at SAU. Next semester, Spanish 102. Merry Christmas. Love you. Thanks, Hope. I just heard from a friend in a tough situation, and I feel very inadequate, but I want to be a blessing to her. I think the cookies look great!! I am facing my own cookie decorating soon. Some I want to give as gifts so I feel like I need to decorate them a bit. I printed out the picture of the cookies for my reference!! 🙂 Yes, you can do all things through Christ who gives you strength!! That was a message I needed to hear today!! Thank you for sharing it. Your title grabbed my attention. We’re so glad you’re in Brasilia taking opportunities, brightly decorated, to reflect Jesus.